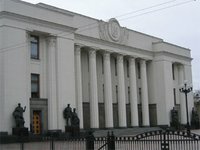 The Verkhovna Rada of Ukraine has decided to propose the next president award the title Hero of Ukraine on civil protesters who were killed in the clashes with the riot police. A relevant resolution was supported by 346 MPs, an Interfax-Ukraine correspondent reported. During the discussion, representative of the Party of Regions Nestor Shufrych suggested applying this resolution to all parties of the conflict, including law-enforcers who died in the riots, but MPs did not back this initiative.